What is All Souls Day? It is when the Church commemorates and prays for the holy souls in Purgatory, undergoing purification of their sins before entering heaven. All Souls Day is November 2nd, the day after All Saints Day. 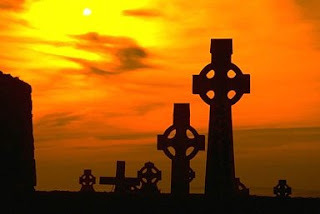 All Souls Day follows All Saints Day, and commemorates the faithful departed, i.e. those who die with God's grace and friendship. Catholics believe that not all those who die in God's grace are immediately ready for the Beatific vision, i.e. the reality and goodness of God and heaven, so they must be purified of "lesser faults," and the temporal effects of sin. The Catholic Church calls this purification of the elect, "purgatory." The Catholic teaching on Purgatory essentially requires belief in two realities: 1. that there will be a purification of believers prior to entering heaven and 2. that the prayers and masses of the faithful in some way benefit those in the state of purification. As to the duration, place, and exact nature of this purification, the Church has no official dogma, although Saint Augustine and others used fire as a way to explain the nature of the purification. Many faithful Catholics, including Pope Benedict XVI, grant that Purgatory may be best thought of as an existential state, as opposed to a temporal place (see Benedict's Eschatology: Death and Eternal Life 230-231). In other words, because Purgatory is outside the confines of created time and space, it is not necessarily accurate to speak of a location or duration of Purgatory. Nonetheless, the prayers and Masses of the faithful do have an impact on the purification that the faithful are undergoing in Purgatory. Many non-Catholics, including C.S. Lewis, have believed in Purgatory, and the official dogma of Purgatory is hardly offensive, even if the popular understanding of it has led to confusion. As a more everyday explanation, many liken Purgatory to a place or state where one gets "cleaned up" before entering into the presence of Almighty God. When I was kid, November one is the All Soul's Day but when I got the education I learned I was wrong!